Last evening we were at Prithvi for the opening of a six-day festival of plays produced by RAGE, a theatre group that currently comprises Rahul da Cunha, Rajit Kapoor and Shernaz Patel. The festival kicked off with Girish Karnad's Flowers, directed by Roysten Abel and featuring a virtuoso solo performance by Rajit Kapur. Flowers follows a kind of formula established by Karnad, which involves taking an Indian folk tale or myth, and marrying it with acute psychological realism. This merger allows his kings, priests and courtesans to appear relevant and contemporary without any allegorical intrusion. Because nobody else employs this method, and because Karnad chooses tales judiciously and fleshes them out convincingly, his oeuvre is original and significant. His welding of forms, however, has a major drawback. The disparate narrative traditions being blended tend to produce very different sorts of endings when left to themselves. Karnad has rarely, to my mind, dovetailed or fused the two in a satisfactory final scene. There are plays, like The Fire and the Rain, in which he finds some kind of equilibrium, but all too often the end seems like a cop-out, and Flowers is no exception. 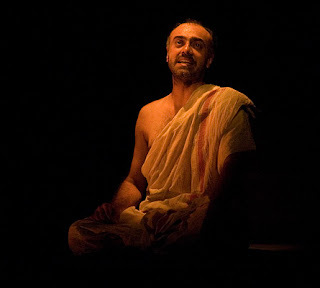 The play is the story of a priest obsessed with decorating the linga in his temple (spoilers ahead). He becomes equally obsessed with a local courtesan, and their affair leads to trouble with the region's chieftain. The priest's public shaming is averted by a miracle, but that results in a personal crisis, because he is now seen as a saint and wants none of that attention. He informs the audience that the courtesan has left town before commiting suicide. There weren't too many options left for Karnad after the miracle, but keeping the irony, pain and bitterness involved in the priest's situation alive and unresolved would have worked better for me than the precipitate suicide. When I started writing for newspapers, one of my early commissions was a review of Karnad's Nagamandala, an English translation of which had just then been published. I liked the play a lot, aside from the cop-out ending, and said as much. A couple of months later, I applied for a scholarship to study in England, and who should be on the final interview panel but Girish Karnad. The first thing he said to me was that he had read my article. I don't know how he would have taken it if the piece had expressed an intense dislike of Nagamandala, or how that would have fed into his and the committee's opinion of my application, but I've never been gladder to have published a positive review. why do you write this blog girish? Don't know if this comment will reach you, but when I first read Nagamandala around 1992 I loved the ending and ordered the script for a graduate class. The texts which arrived in the bookstore, and which my students bought, had a completely different ending--a bit chopped and two pages added. Karnad ends his script for the movie, Cheluvi, with a question about the ending. He knows that folktales are meant for change. Road to Hell or Stairway to Heaven?